From the BBC: “Israel and the Palestinian Hamas movement which governs Gaza have agreed a ceasefire to end a week of violence in which nearly 160 people have died. In this instance, the chart is set for Gaza City. All points north of that in the area will also have Leo rising. The first thing that will strike the horary or electional astrologer is the very early rising degree. This usually indicates that the time is too early to ask a question or the time is not yet ripe for a venture. Leo rises, with its Domicile ruler the Sun Peregrine, in a late degree in the Terms of Saturn, and will aspect Neptune first when changing signs. 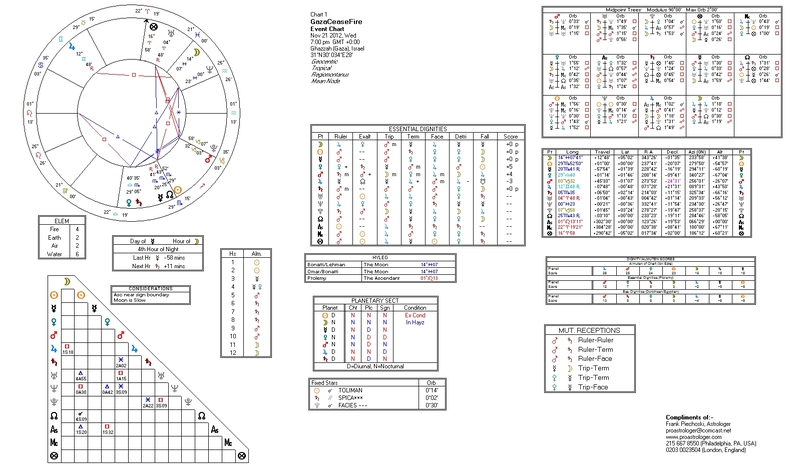 The Sun’s Dispositor is Mars, Exalted in Capricorn, who applies to conjoin Pluto and square to Uranus. The only planet in Domicile is Venus, in a late degree in the Terms of Mars. Nothing else in the chart other than the 4th and 11th house (Regiomonatus) cusps disposes toward her. Everything else disposes toward a Mars/Saturn Mutual Reception by Domicile. There are many other factors that I won’t mention based on the immediacy of this article. This is in no way a permanent solution – or even one that will last any significant period of time. Hi Frank, This article makes me wonder about charts for other military events with Israel, It would be interesting to look at them and see if there is any pattern for events where the peace lasted longer.